It's not too late to register for the TSU Teacher Job Fair! 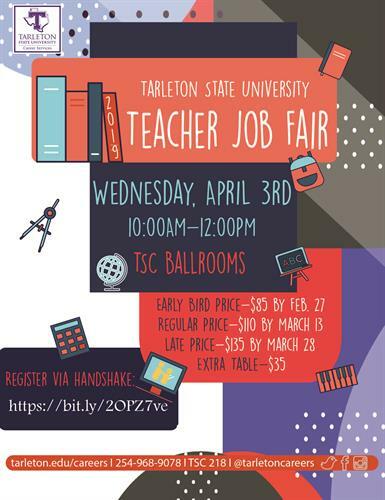 Tarleton’s Career Services Center's annual Teacher Job Fair will allow students, alumni, and the community an opportunity to meet with school districts in various locations that are currently hiring. There is no fee to attend the fair. Registration includes 1 table for 2 representatives. Fee for additional representatives is $15.00 per person. Fee for additional tables is $35.00 per table.